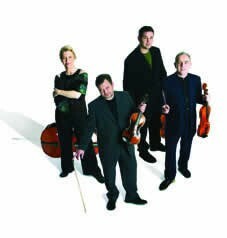 The Brodsky Quartet is literally head and shoulders above its rivals, because the violinists and violist stand while playing. However, critical reactions to its performances and recordings suggest that the phrase applies figuratively as well! This programme begins with one of the quartets Mozart dedicated to Haydn, nicknamed ëThe Huntí because of the ëhuntingí metre of the first movement, and ends with one of the most ambitious and varied of Beethovenís extraordinary series of late quartets. In between comes a work written by the Moravian composer Leos Jan·c˘ek at the very end of his long life, inspired by his passionate love for a younger married woman and originally to have been called ëLove Lettersí.